Technical Car Experts Answers everything you need: Where to Connect Fog Light on Dodge Truck? Where to Connect Fog Light on Dodge Truck? Car fog lights are usually mounted in or below the front bumper Car fog lights are intended for use at low speed to increase the illumination of road surface. If you truck does not have wiring harnesses and connect for the fog lights, it won't be an easy task to connect Aftermarket fog lights.It would be easy from the factory. 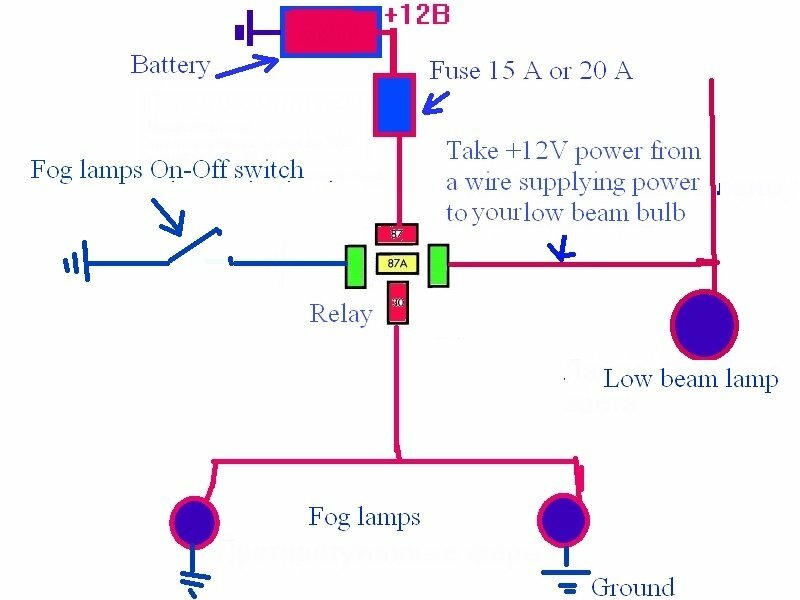 The factory circuitry uses 2 relays that should be in the Power Distribution Box, fog lamp switch, connecting wires, etc. I would install it with a separate : fuseholder and 15-20A fuse, regular relay and on-off switch. Here is the simple wiring diagram that should help you connecting it. Car will not start security lock out? what is no-fault car insurance? Plymouth Colt Vista Head Light Wiring Diagram? Where is Water Pump located on Toyota Corolla? Thermostat Replacement on Toyota Corolla? Replacing thermostat on 1999 Mercury Cougar? How to replace thermostat on 1992 Buick century? Where is thermostat on Audi A6? How to Replace Head Gasket on Toyota Previa ? How to Remove Water Pump on Toyota Previa? How to Remove Engine on Toyota Previa? How to Remove Cylinder Head on Toyota Previa? How to Remove Intake Manifold on Toyota Previa? How to Remove Exhaust Manifold on Toyota Previa? How to Remove steering wheel on Chevrolet Malibu? How to Disarming the Air Bag System?